It's like finding out your best friend has a secret identity. Or two. Not only are they smart, funny, thoughtful and stylish, they're also a super hero. And an accomplished concert musician. And maybe even an astronaut in their spare time. 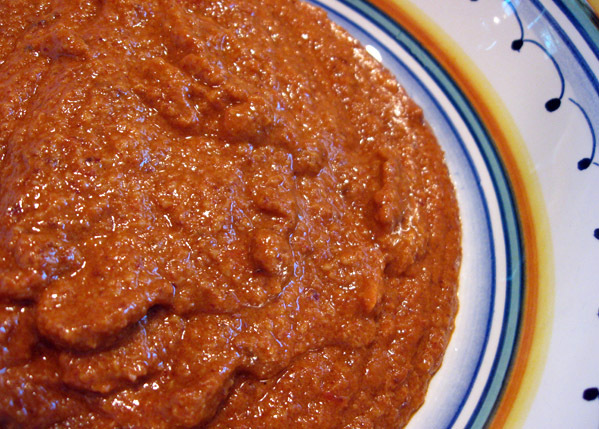 I saw a recipe for a romesco sauce on my brother's blog, did the usual scan of its ingredients to see if it was Dave-safe and put it on the docket for dinner. As I was making it, however, the thought occurred to me that it was not only lactose-free, it was also vegetarian and even qualified as vegan, assuming the bread used for the crumbs has no animal-related ingredients. And, if the bread isn't made from wheat flour, it could even be gluten free. See what I mean about the secret identity? Oh, and by the way, it's also freaking delicious. It makes a nice sauce for pasta, but I think it would really sing when paired with polenta. It could be a wonderful dip for vegetables and a nice sauce for grilled meat. I dunno, but that super hero reference might be all too apt! Place dried pepper pieces in a small bowl, add 1/2 cup very hot water, and soak until softened, 20-30 minutes. Drain, setting aside the soaking liquid. Place the hazelnuts in the food processor and pulse until they are ground medium-fine. Add the pepper pieces, 1/3 cup of soaking liquid and the garlic, bread crumbs, tomato, paprika and cayenne and process until fairly smooth but still with some texture from the nuts. With the motor running drizzle in the olive oil until it is completely incorporated. Scrape the sauce into a bowl. Stir in the vinegar and season with salt to taste. Cover the bowl with plastic wrap and place in the refrigerator for 30 minutes to allow the flavors to meld. Taste the sauce before serving, adding more vinegar and cayenne if desired. The sauce will keep in the refrigerator for about a week. Makes about 1 1/2 cups. Preheat oven to 350°. Spread nuts on rimmed cookie sheet and bake for 10-15 minutes until skins start to darken and blister. Remove from oven and wrap in dish towel and let cool for 5 minutes. While nuts are still in the towel, rub vigorously to remove as much skin as possible. There will still be a fair amount of skin attached to nuts, but it doesn't matter in the finished dish.